HAZEL DELL — Along Northeast 13th Avenue in Hazel Dell there are at least a dozen motorhomes. Some of them have been there for months, despite frequent complaints by people who live in the area. “The sheriff will come out and look, and then they tell me to call code enforcement,” says Nita Culver, who manages the nearby Knoll Mobile Home Park at 72nd Street and 13th Avenue. Culver says she’s talked with the sheriff’s office, as well as Clark County Code Enforcement. Still, the RVs sit there day after day. Meanwhile, residents say the people who live in many of the motorhomes leave trash all along the street. Charlie Knight, who lives in Knoll Park and works as Culver’s maintenance supervisor, says he goes out every morning to pick up the trash that has accumulated. Knight says he’s confronted some of the people who live along the street, as has a neighbor who also says he’s cleaned up a lot of trash and even stopped one RV resident from turning on the gas line in his badly damaged motorhome. Clark County Sergeant Alex Schoening, head of the traffic division, was very familiar with the problems on 13th Avenue. But it’s far from the only area they’re dealing with. If they aren’t just dumped, they’re often sold cheaply and under the table to people who either can no longer afford the high cost of rent or are looking for a cheaper alternative. 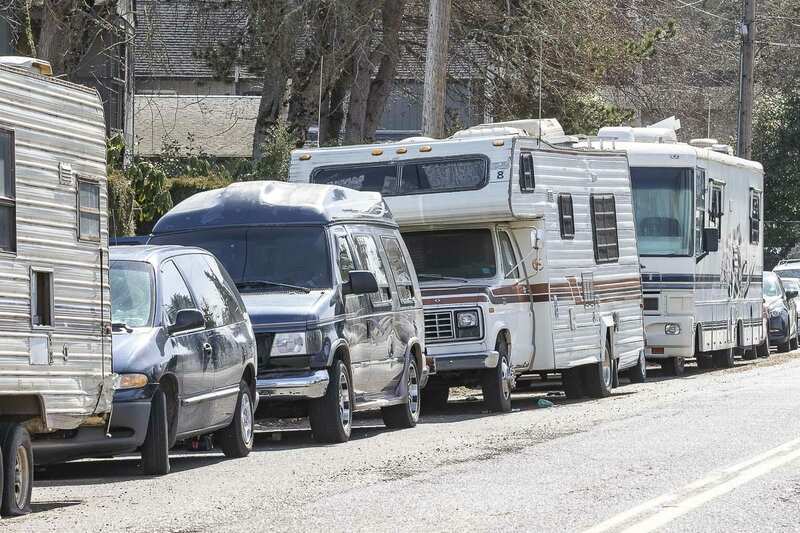 Under county code, occupied motorhomes can’t stay in the same spot longer than 72 hours. 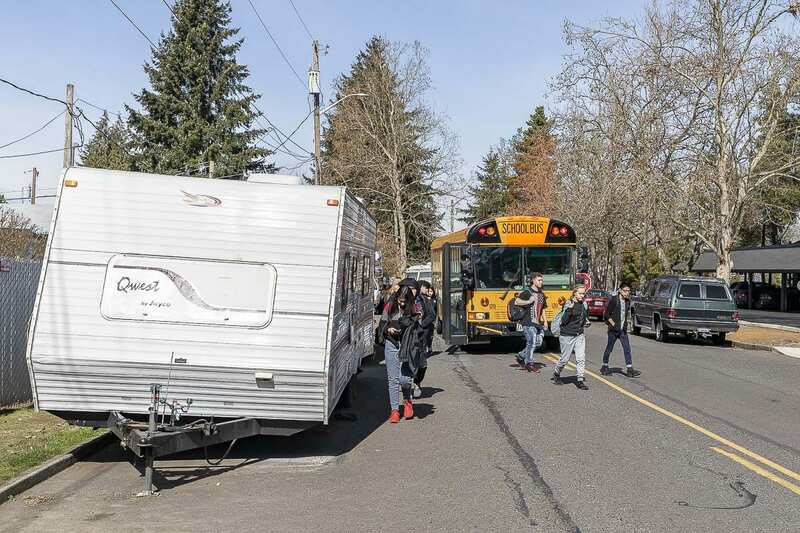 Schoening says the sheer number makes that hard to enforce, but once deputies are called on them, the RV dwellers seem to know where to go, “and they just make sort of this circuitous route back to the side of the road. In general, Clark County Code Enforcement only deals with complaints about derelict or abandoned RVs on private property. But Schoening says he can understand why deputies responding to complaints about needles and human waste along the side of the street could recommend calling Code Enforcement. Nicole Snider with Code Enforcement says they are in the process of hiring another person, in hopes of ramping up enforcement efforts. 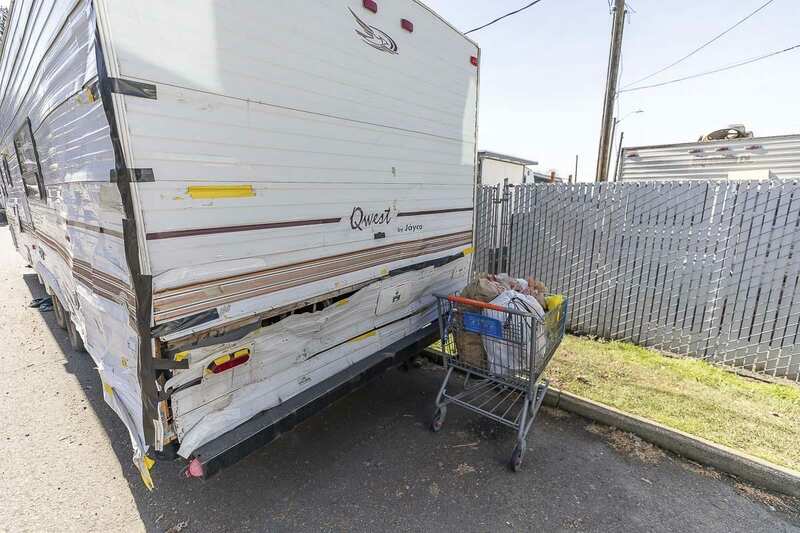 Both Snider and Schoening suggest anyone dealing with derelict motorhomes call 311 and wait to speak with a person. It may not result in immediate resolution of the problem, but it does help the county keep track of where they’re popping up. The biggest issue, at present, is that disposing of a motorhome can cost several thousand dollars. They often contain sewage, known as black water, ammonia in the refridgerator, and sometimes even asbestos inside the walls. And many of the motorhomes along county and city streets were sold without a paper trail, making it more difficult to track down the original owner and charge them for the disposal. 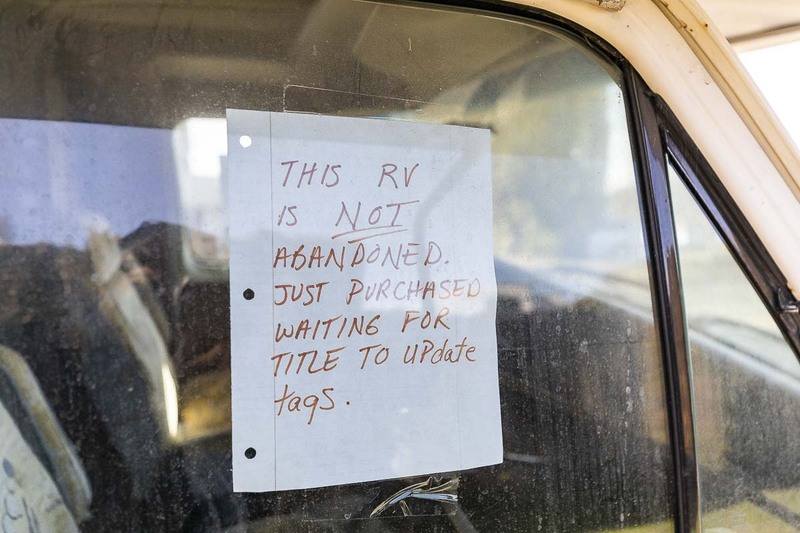 Schoening says he has a deputy working on a contract with local towing companies to dispose of abandoned RVs, but it will require approval from the County Council to spend the money. News that the county is aware of the problem is little comfort to people like Culver, who say constant traffic to and from the RVs create disturbances that wake people up throughout the night. According to the Council for the Homeless, the average cost to get into a rental in Clark County is nearly $3,000, with the average monthly cost for a modest apartment now topping $1,200 per month. That has incentivized an increasing number of people to find alternative forms of housing, and put the county in a crunch when it comes to providing enough options. The council is attempting to address some of that by making it easier to build tiny homes, cottage housing, or Accessory Dwelling Units. They are also considering rules that would allow for RVs as housing on private property in some areas. 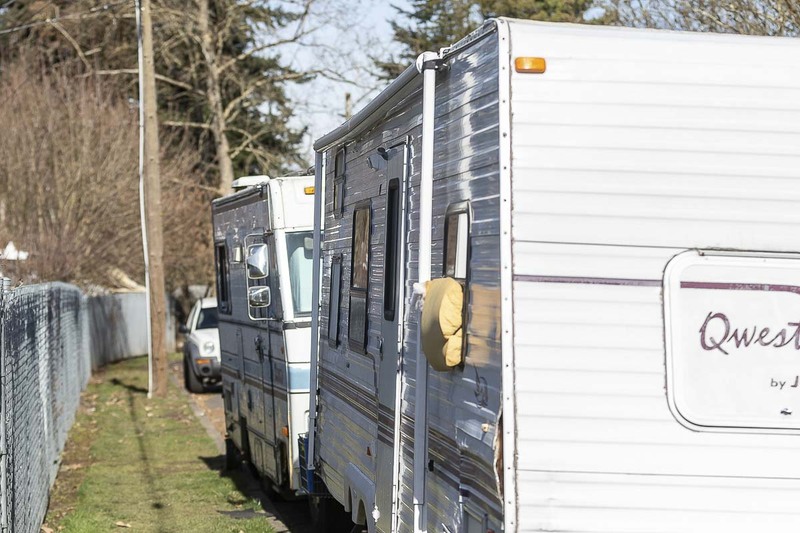 Schoening says he’s hopeful the county will soon give them more tools to help quickly dispose of abandoned RVs, but dealing with the human problem is much more complex, especially in the current economic climate. Those conversations are likely to go on much longer, and at higher levels than the sheriff’s office.